← Is it still gauche for CPAs to cry? On average it takes seven years to build a public accounting practice. As many of you can testify, it’s not easy obtaining clients, even though we are bombarded hourly with emails from marketers promising and guaranteeing instantaneous success. Many of us spend thousands of dollars for a website, containing “twenty seven eight-by-ten colour glossy photographs with circles and arrows and a paragraph … explaining what each one was….” Some of us even install flash videos on our websites in an attempt to make them more dynamic and alive. Of course, there are the usual blurbs cataloguing our credentials and areas of expertise, in an attempt to distinguish us from the billion of other CPAs out there. And we add a few gadgets, like tax calculators, or a few tax tips to fill up the dozen or a half dozen pages on our site. The best advice I can offer anyone desiring to establish an accounting practice is what I acquired from my friend, “Harvey”. 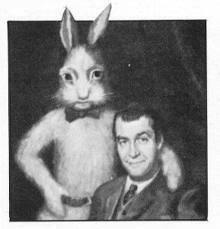 Harvey befriended me years ago: in fact, to be a little more precise, 31 years, 23 days, 17 hours, and 9 minutes ago. I had just returned home after working 12 hours non-stop at an accounting sweatshop on Lewis Street in downtown Hartford, Connecticut, when at my doorstep I was greeted by a 6′ 3.5″ pooka named Harvey. That evening Harvey and I sauntered down to Charlie’s and had a very long conversation about accounting, accounting firms, and life in general. While we were downing beers one right after another (one gets very thirsty talking to Harvey about life), I recounted to Harvey about my treatment at this particular accounting firm sweatshop, bemoaning the inhumane treatment by my superiors. Harvey listened very attentively, and eventually after several hours, and many beers (when you are with Harvey, you lose count), offered the following advice about life in general. I recount it now to all of you. Perhaps you may find it of some use. Here is what Harvey told me. Years ago my mother used to say to me, she’d say, “In this world, Harvey, you must be” – she always called me Harvey – “In this world, Harvey, you must be oh so smart or oh so pleasant.” Well, for years I was smart. I recommend pleasant. You may quote me. Although I recall these words precisely as I quoted them above, it took me several decades to absorb the essence of their meaning to life in general and to the marketing of my accounting practice today. I have discovered that just by being “oh so pleasant” to individuals calling me about accounting, QuickBooks, taxes, or whatever, that I have had some success in building an accounting practice. I discovered that I didn’t need a very expensive office on the 26th floor in downtown Hartford, nor an expensive website featuring flash videos and the like, nor any trappings of success. Nor did I require an Einstein command of taxes and GAAP. There are plenty of Einsteins around; and they usually work for individuals who are not Einsteins, but who know how to acquire clients. I hope Harvey’s advice works for you as it did for me. Harvey wishes you a Happy New Year. We are about to stroll down to Charlie’s right now. You are welcome to join us. This entry was posted in Accountants CPA Hartford, Articles and tagged Harvey and the Barefoot Accountant, Harvey on life and accounting, how to market an accounting practice. Bookmark the permalink.